Lebanon Police Officers received awards last night at the City Council Meeting, Lebanon Police Officer Christopher Allen, Senior Officer Jonathan Tracy and K-9 Briggs received the Meritorious Police Service Bar for Lifesaving. The bars are awarded to any member of the police department who performed a physical act(s) to save another person. Officer Allen saved a female who found was unconscious and not breathing at the Fireside Inn in December. Officer Allen performed CPR chest compressions and Officer Allen was able to revive the woman while awaiting medics. 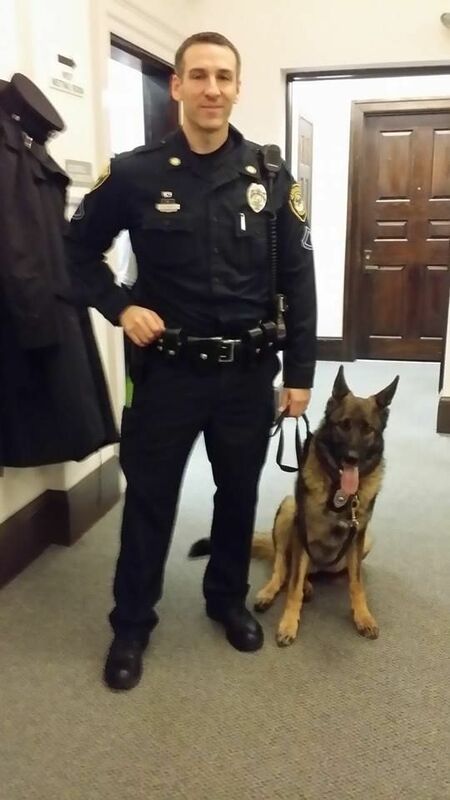 Senior Officer Tracy and K-9, Briggs, tracked the driver of a motor vehicle accident on the interstate on January 16. The driver had left the scene and Officer Tracy and K-9 Briggs tracked him into the woods. Tracy and Briggs found the occupant injured and suffering from the onset of hypothermia after 10 hours of being in the woods. Without Officer Tracy’s dedication and determination, the occupant likely would have succumbed to his injuries and the freezing temperatures. Lebanon Police Chief Richard Mello presented the awards and later praised the department’s K-9 unit. Sunapee’s Coffee with the Chief is becoming a popular destination with growing attendance and visitors stopping by. Russell E. Holden, Sunapee School District Superintendent, was one of the guests attending Coffee with the Chief yesterday at the Safety Services Building. Superintendent Holden spoke of the importance of the partnership between Sunapee’s school district and the police department and gave information on the school budget and school news. Sullivan County’s High Sheriff John Simonds also attended the event. Simonds brought Sunapee residents up-to-date on new programs and news of the Sheriff’s Department. Coffee with Chief is held once a month. If passed, House Bill HB 1602 will punish NH residents for being financially responsible. The Bill calls for a road use tax with cars getting the best miles per gallon paying the most. It also charges you for the miles you travelled. For example, if you get 50 miles per gallon and travel 20,000 you would pay a $222.00 road use (fee) tax in addition to your regular registration costs. The Public Works and Highways Committee established this Bill to study revenue alternatives to the road toll. If passed the road use tax is effective on January 1, 2017. Below is a list of the proposed fee charges without mileage, followed by the Bipartisan Committee that composed the Bill if you want to contact them follows it. The better gas mileage you get the more you pay. Two Franklin residents were arrested on various Drug Charges on Thursday. New Hampshire State Police Narcotics and Investigations Unit, and members of the Franklin Police Department, executed a search warrant at 68 West Bow Street in Franklin and arrested Dawn Lent 31, and 59-year-old Donald Lent. Dawn Lent was charged with Possession with Intent to Distribute Heroin, and Possession with Intent to Distribute Methamphetamine. Dawn Lent is being held on $10,000 cash bail and is scheduled for arraigned on January 21, 2016 in Franklin District Court. Donald Lent was arrested and charged with Possession of Heroin; he was released on $5,000 personal recognizance bail and will be arraigned on April 12, in Franklin District Court.